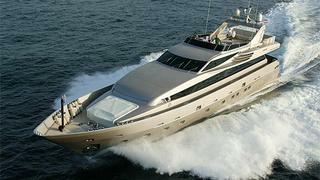 News just in from Ocean Independence that Rainer Wilhelm has sold the 33.8m motor yacht Lumar. Built in aluminium to ABS class by Italy’s CNL yard in 2007, and to a design by Luca Dini, Lumar has been dry stored out of season and has never been chartered. Accommodation is for eight guests in four staterooms, while twin 2,400hp MTU engines give her a range of 1,000 nautical miles at 13 knots. Lumar was asking €4.15 million.